The Rebel Sweetheart. : Foodie Goodie | Tofu Ginger Stir-fry. 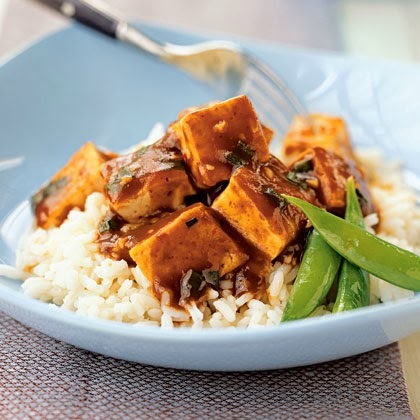 Foodie Goodie | Tofu Ginger Stir-fry. I love tofu. And I love it for so many reasons. For one, it's a very healthy food. In fact, it's listed as one of the world's healthiest food. It's low in calories, low in fat, contains no cholesterol, but packed with a variety of nutrients. Studies show that regular tofu consumption helps lower bad cholesterol, alleviates symptoms associated with menopause, and even lowers the risk of cancer. It also helps in making the bones stronger, and delaying the signs of aging. As an ingredient, tofu is one of the cheapest yet the most versatile. It adapts to any flavor profile and can be cooked in a variety of ways. It's a staple in Korea, and a popular component in Asian dishes. Speaking of cooking, here's one of my favorite ways to cook tofu (aside from the usual deep-fried crunchy tofu which I swear I can eat everyday without even getting sick of, lol). 1. In a bowl, combine brown sugar, soy sauce, garlic powder, ginger, salt, and pepper. Mix well, then set aside. 2. Heat a large skillet over medium high heat and add olive oil. 3. Add tofu to the pan and stir-fry until the sides turn slightly brown. 4. Add in the brown sugar mixture. 5. Simmer for at least minutes, then add the green onions. Let it simmer for another minute before turning off the heat. 6. Serve over steamed rice. Tofu is one of my favorite components in Asian dishes, too. I had to discover the more dense tofu though. The super-soft mushy stuff is not good. AND I do not like tofu burgers. Give me meat for that! I am going to add tofu to my shopping list so I can make this next week! Am not a Tofu person but I want to try this especially its for Lent. I cook a similar dish too, but with oyster sauce instead of soy sauce. Really tasty! The recipe you shared is simply yet I know that it is something that will let my palate enjoy with. Ooohh...I love tofu!!! The other day, I ate sweet and sour tofu. Though I can't eat it every single day. Hehe! Three times a week is enough. ooh, interesting way to cook tofu! i LOVE tofu (same here, I can eat the crunchy tofu everyday!) and this looks like it's going to be a hit with the family! bookmarked! 5 Great Jewels For Engagement Rings. Wordless Wednesday #77 | Sunnies! Spotlight | Tony Moly Black Bee Emulsion. The Lowdown on Diamond Trade. Wordless Wednesday #76 | Outstanding! Spotlight | NeoCell Keratin Hair Volumizer. Spotlight | NeoCell Beauty Bursts + Giveaway! Wordless Wednesday #75 | I Love My Job! Spotlight | Samyo Bed and Linen Spray + Giveaway! Foodie Goodie | Salmon Rice Bowl. Wordless Wednesday #74 | Spaghetti Monster!